Situated on the outskirts of dusty Samarkand, among rolling hills and bordered by a quiet stream, the Tomb of the Prophet Daniel is a much-visited holy place for Islamic, Christian and Jewish pilgrims. 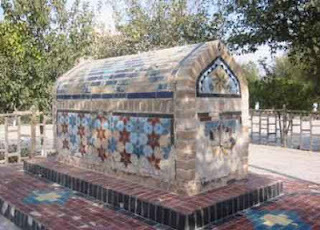 Known locally as the Mausoleum of Khodja Daniar, the crypt is believed to contain the arm of Prophet Daniel. According to local legends, this ancient relic was brought to Samarkand by the warrior king Tamerlane after he stole it from Makkah. The length of the crypt, being over 18 meters long and far larger than is necessary for a simple arm bone, is explained by a curious legend stating that the arm bone miraculously grows larger with each passing year. Shahr-i-Zindar : Another important pilgrimage site in Samarkand is Shahr-i-Zindar, a mausoleum complex dating from the 7th century. Shahr-i-Zindar stands for 'The Living King' and refers to the grave of Qusam ibn-Abbas, a cousin of the Prophet Mohammed, who is said to have first introduced Islam to Central Asia in 676. Under the Abbasids his tomb was venerated and the legend developed that he did not die but was miraculously engulfed in a cliff, hence the name 'The Living King'. According to the great Islamic traveler Ibn Battuta, the shrine was so famous that it was not destroyed during the Mongol invasions. Today the shrine is in a much-dilapidated condition but is still visited by many hundreds of pilgrims each day. 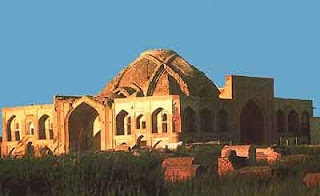 Other nearby tombs, dating mostly to the 14th and 15th centuries, belong to the family and friends of Tamerlane and Ulugh Beg. In the Samarkand region there are two other pilgrimage shrines called Khodja Abdi Darun and Chupan Ata. Twelve kilometers north of Samarkand stands the recently renovated shrine complex of the 9th century Islamic saint Muhammad Ibn Ismail al-Bukhari. Born in Bukhara in 810 AD, he made a pilgrimage to Makkah as a teenage boy, spent 12 years living there and then traveled widely throughout the Muslim world collecting Hadith, these being the traditional sayings of the Prophet Muhammad. Nearly 3000 of these were compiled into a book known as Al-Jami al-sahih, which is considered by many Sunni Muslims to be the most authoritative collection of Hadith and a religious book second only to the Quran. 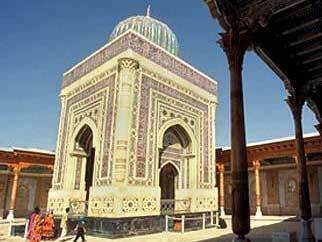 Al-Bukhari died in 870 and his tomb became a celebrated place of pilgrimage for Muslims from throughout Central Asia. The Naqshbandi Sufi order, which traces its lineage back to Ali, Abu Bakr and other central figures in early Islam derives its name from that of a 14thcentury Central Asian mystic named Baha al-Din al-Naqshbandi. 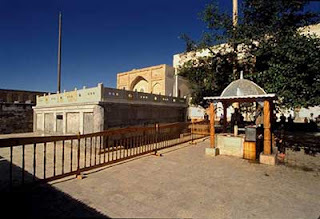 Born in 1317 AD, in the village of Qasr al-'Arifan near Bukhara, he experienced profound visionary revelations in his youth, became a brilliant Islamic scholar before the age of twenty, made the Hajj pilgrimage to Makkah three times and became a greatly venerated holy man during his life time. Visitors from across Central Asia came to Bukhara to see the sage, seek his advice, and receive teachings in the school he had established. Following his death in 1388, Sheikh Baha al-Din al-Naqshbandi was buried adjacent to his school, directly upon the site of an ancient pagan temple. Historical records from the medieval era indicate that Naqshbandi was revered as a saint and a protector of craftsman and artists, and that pilgrimage to his grave was considered an adequate substitution for the Hajj pilgrimage to Makkah. Successive kings of Bukhara expanded the school and mosques surrounding Naqshbandi's grave and over the centuries the complex became the largest center of Islamic learning in Central Asia. During the Soviet period, the mosque was turned into a "museum of atheism" and pilgrims were forbidden to visit. In 1989 the shrine was reopened and the entire complex, with two mosques and a 16th century khanaka (a domed hall where the Sufis lived and studied), has been carefully restored. Lovely shaded gardens surround the shrine and the entire site radiates a palpable feeling of religious devotion and peaceful relaxation. Dressed in colorful traditional clothes and speaking a variety of languages, pilgrims from distant parts of Central Asia flock to the saint's grave throughout the year. 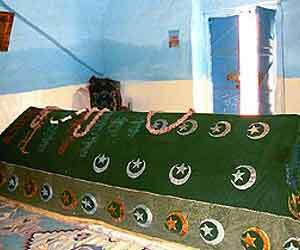 The Naqshbandi Sufi order is one of the oldest living traditional Sufi orders. The early members of the order rejected outward shows of religious expression and concentrated upon the inner spiritual life while engaged in the affairs of the world. With followers throughout Central Asia, Turkey, Afghanistan, Pakistan and India, the Naqshbandi Sufis, as both traveling merchants and mystics, played a major role in the introduction of Islam across Asia. Believing that piety is better expressed by social activity than retreat from the world, the Naqshbandi masters often became actively involved in politics. By the 15th century they had become the dominant Sufi order in much of Central Asia and actively influenced politics from China to India to the Middle East. Today the Naqshbandiyya is the foremost Sufi order in the world and is experiencing an unprecedented period of growth, not only in its traditional heartlands of Central Asia, Turkey, the Middle East and South Asia, but in nations of the Western world, particularly the United States and Great Britain. Timur's Summer Palace, the “White Palace” was planned as the most grandiose of all Timur's constructions. It was started in 1380 by artisans deported by Timur from the recently-conquered Khwarezm. Unfortunately, only traces of its gigantic 65 m gate-towers survive, with blue, white and gold mosaics. Above the entry of the Ak-Saray are big letters saying: "If you challenge our power - look at our buildings!" East of the Kok Gumbaz is another mausoleum complex called Dorussiadat (Seat of Power and Might), which contains the Tomb of Jehangir, Timur’s eldest and favorite son. The adjacent mosque is said to house the tomb of a revered 8th century imam from Iraq, Hazrat-i Imam, "Holy Imam". Behind the Hazrat-i Imam Emsemble is a bunker with a door leading to an underground chamber, discovered by archaeologists in 1943. The room is nearly filled with a single stone casket, on which inscriptions indicate that it was intended for Timur. However, the conqueror was buried in Samarkand, not at Shahrisabz, and mysteriously, his tomb in Shahrisabz contained two unidentified corpses. 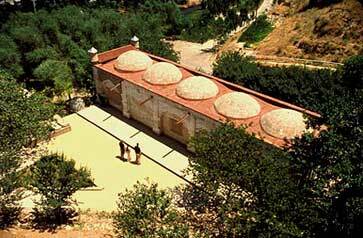 Also of interest are medieval baths and an 18th century bazaar. In his childhood he was a wrestler. He used to practice all of its arts, until he became one of the most famous wrestlers in his time. Wrestlers would gather around him to learn from him. One day, a man watching him wrestle had the following thought come to his heart: "How is it that a person who is the Descendant of the Prophet and who is deeply knowledgeable in shari'a and tariqat, is practicing this sport?" He immediately fell into a deep sleep and dreamt that it was the Judgement Day. He felt that he was in great difficulty and that he was drowning. Then the shaykh appeared to him and rescued him from the water. He woke up and Sayyid 'Amir Kulal (qs) looked at him and said, "Did you witness my power in wrestling and my power in intercession?" One time his shaykh-to-be, Muhammad Baba as-Samasi (qs), was passing by his wrestling arena, accompanied by his followers. He stopped and stood there. An evil whisper came to the heart of one of his followers saying, "How is it that the shaykh is standing here in this wrestling arena?" The shaykh looked at his follower immediately and said, "I am standing here for the sake of one person. He is going to be a great Knower. People will come to him for guidance and through him people will reach the highest states of Divine Love and the Divine Presence. My intention is to bring this person under my wing." At that moment Sayyid 'Amir al-Kulal (qs) gazed at him, was attracted and abandoned the sport of wrestling. He followed Shaykh Muhammad Baba as-Samasi to his house. Shaykh Samasi taught him the dhikr and the principles of the distinguished tariqat and told him, "You are now my son." 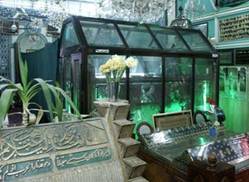 Khwaja Ubaidullah Ahrar (Q) was born in the village of Shash in Ramadan, 806 AH., or March 1403 A.D. His father was a prominent dervish. He was brought up in Tashkent by his uncle Ibrahim Shashi, a great scholar of his time who gave him early education. When he graduated in the worldly sciences, his uncle sent him to Samarqand for acquiring heavenly knowledge. The signs of sainthood were visible in him since his childhood. Khwaja Ahrar (Q) used to say: "from the age of three years, I was in the Presence of Allah. When I studied the Qur'an with my teacher my heart was in God's Presence. I used to think that all people were like that." Sayyid 'Amir al-Kulal followed Shaykh Samasi for 20 years, spending all his time in dhikr, seclusion, worship, and self-denial. No one saw him in these 20 years except in the company of his shaykh. He would come to see his shaykh in Samas every Monday and Thursday, although the distance was five miles and the journey difficult, until he reached a state of unveiling (mukashafa). At that time his fame began to spread everywhere until he left this world. He became the teacher and mentor of Turghai (Trush) (died 1356 AD) the head of Berlas tribe and his son 'Amir Timur (died 807/1405). One of his most famous disciples was Muhammad ibn Muhammad Baha'ud-Din al-Uwaysi al-Bukhari (qs) who used to work as an executioner in Bukhara under the rule of King Qazan. One day Baha'ud-Din (qs) was ordered to execute a man who had angered the ruler of the state. However, right before his execution the accused called upon Shaykh 'Amir al-Kulal (qs), identifying him as his teacher. Shaykh 'Amir al-Kulal (qs) intervened and the accused was set free on his intercession. This was Baha'ud-Din's first encounter with Shaykh 'Amir al-Kulal. Impressed by him, Baha'ud-Din became his student. Shaykh 'Amir al-Kulal had four children, as-Sayyid al-'Amir Burhanuddin, as-Sayyid al-'Amir Hamza, as-Sayyid al-'Amir Shah, and as-Sayyid al-'Amir 'Umar. Shaykh Sayyid 'Amir Al-Kulal (qs) died in the same village in which he was born, Sukhar, the 8th of Jumada al-Awwal, 772 AH/1370 and was buried in Shahrisabz (Kesh); the Green City. His tomb was completed by 1374 AD under the orders of Timur. Majority of Timur's family is also buried at the same place. Shaykh al-Kulal's descendants moved to India with Mughals establishing an empire there and majority of them remained as teachers and mentors of Mughal Princes and Kings or their close friends. To know more about the life and works of Shaykh Sayyid 'Amir al-Kulal (qs), one can read Maqamat-i-'Amir al-Kulal composed by his great grandson Shihab ul-Din. It consists of 70 tales about him. About Shahrisabz is a city in Uzbekistan located approximately 80 km south of Samarkand with the population of 53,000 (1991). It is located at the altitude of 622 m. Once a major city of Central Asia, it is primarily known today as the birthplace of 14th century Turkic conqueror Timur. Its name means "green city" in Persian. 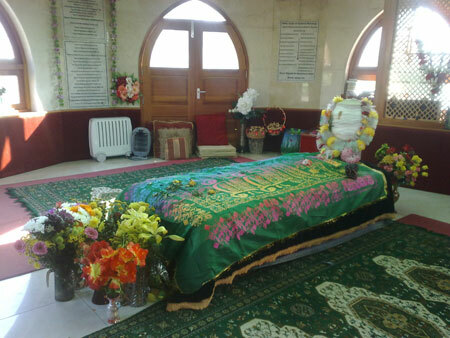 The tomb of Sheikh Sayyid Amir Kulal. “Rising in the morning hours at least three hours before fajr I would perform the sunnah prayers and thereafter in the position of sajda (prostration) ask Allah Almighty to give me the power to carry the pain of His Divine love. Thereafter I would pray salat ul fajr with my Sheikh. It seems that my Sheikh was aware of my supplication, for he told me, “You will have to change your method of supplication as Allah Almighty does not like His servants to ask for difficulties. He might however in order to test his creatures give them some difficulties. This is different. The servant should not however ask to be in difficulties because this will not be showing proper respect to Allah Almighty. Therefore change your supplication and instead say “to this weak servant of Yours, oh my Lord grant Your pleasure”. “After the death of Sheikh Muhammad Baba Samasi I went to Bukhara and also got married there. 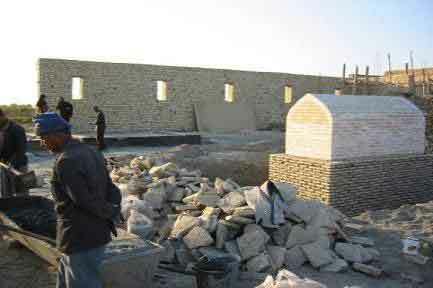 I lived in Qasr al-Arifan near Seyyid Amir Kulal in order to serve him.” It is related that Sheikh Baba Samasi had a long time ago told Seyyid Amir Kulal to take good care of shahBahauddin Naqshaband. washed my clothes and then prayed two rakaat’s of prayer in a manner that I had never prayed before as I felt that I was praying in the very Divine Presence. Unveiling was taking place in my heart and it was opening to everything. The entire universe vanished and I was not conscious of anything other than praying in His Divine Presence”. done”. To this I replied again “whatever I say and whatever I do should be the way”. After this I was left alone. wanting what one wants. Yet after the initial refusal Shah Bahauddin (ral) was granted his request. It may be that because he asked on behalf of others and not for himself that what he wanted was granted. This then was the consideration that Shah Bahauddin Naqshaband (ral) had for others and this we assumed was the reason that this request was granted. 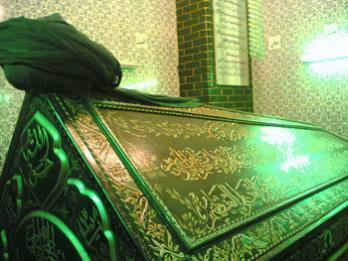 The tomb of Sheikh Muhammad Baba as Samasi. bleeding in both my feet which were torn and pricked with thorns. Then I felt that I should go to the house of my Sheikh, Seyyid Amir Kulal. It was biting cold in the night and the night too was dark with no moon or stars. To prevent the cold I had nothing on me but an old leather cloak. Then I arrived at my sheikh’s house and saw him together with his friends and followers. He saw me and told his followers, “take him out of my house, I do not wanting him in my house”, so the followers came and put me out of the house. I could not bear it”. going to allow you to make me lose the love and trust for my Sheikh”. “I then felt a deep depression overcome me. I held fast to the state of humbleness, put my head down on the entrance of my Sheik’s house and swore that I would not remove it from there until he accepted me one more time. I could feel the snow and the cold wind going right through my bones which were making me shiver and tremble in this cold dark night. 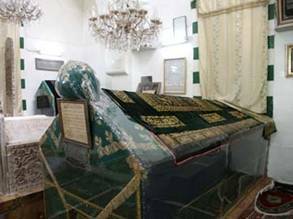 The Tomb of Sheikh Abd al Khaliq Gujadawani. happiness and the dress of Divine Love. This dress which your have been adorned with neither my Sheikh before me nor I have been dressed in such a manner. Allah is happy with you and the Prophet Muhammad (sal)is happy with you. The Saints of the Golden Chain are also all happy with you”. Oneness of Allah. It is not possible for words to explain this state. This can only be experienced by tasting through the heart”. cloak that he gave you is still in your house and with his blessings Allah Almighty has removed from you many troubles”. Muhammad (sal). You have to go into and investigate the life of the Prophet Muhammed (sal)and his companions. You must ask people to read and to follow the Quran both during the day and night and to do the compulsory prayers and all the sunnah worship. Do not overlook even the tiniest thing of the Prophet Muhammad’s (sal) deeds and good works”. “As soon as Abd al-Khaliq al-Ghujadawani (ral) finished, his khalifs told me “so that you can be certain of this vision he will be sending you a sign”. He was told that certain things and incidents would happen and as to what he had to do, as and when they happened. family as to its whereabouts. They told me, “it has been here for a long time”, and brought and gave it to me. I started crying inside when I saw the cloak. of the masters of Shah Bahauddin Naqshaband (ral) although he lived a long time before the time of Shah Naqshaband (ral). This connection is known as the Uvaisi Connection which means that the guide is spiritually connected and guides, although he is from another time. Sheikh Abd al-Khaliq al-Ghujadawani (ral) is also a Master of the Golden Chain of Masters. 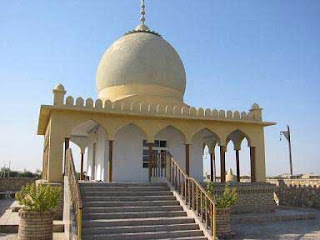 Shah Bahauddin Naqshaband's (ral) Mausoleum. and to help the broken hearted. He asked me to be humble and to keep to tolerance. He also told me to take care of animals and to cure their deceases and to clean their wounds and also to help them find their food”. I was adorned and dressed with Allah Almighty’s attributes. I began shaking in a way that I had never experienced before so much so that I could not remain standing. I then saw a great vision in which I was totally annihilated and I could not see anything other than the Existence of my Lord. died. However after about six hours I was ordered to return to my body. I could see my soul re-entering my body slowly and then the vision ended”. knowledge and the granted secrets from the Unique Oneness that no one before me had ever shared”. contemplating as to what I should do in this situation. Suddenly Divine Inspiration came to me and I said pointing to him “Oh Muhammad Live!” three times. To my joy his soul slowly started to return to his body and then he gradually returned to his original state. I quickly went to my sheikh and told him about this incident to which he replied, “Oh my son, Allah Almighty has given you a secret which he has not given to anyone else”. up his finger and recited the Shahada Kalima, bearing witness to the One God and the messenger hood of the Prophet Muhammad (sal). With this his soul returned to Allah. The date was the 3rd of Rabi-al-Awwal, 791 AH/1388 CE, on a Monday night. As he had requested, he was buried in his own garden. Regarding this a great Saint of the time Abd al Wahab ash-Sharani said, “when the sheikh was buried in his grave a window to paradise was opened for him, making his grave a paradise from heaven. Two beautiful spiritual beings came and greeted him saying, “We have been waiting to serve you from the time that Allah created us and now the time has come for us to serve you,” to which Shah Bahauddin Naqshaband (ral) had replied, “I am not in need of looking at anything other than Him. I do not need you, I need Him”. This is how the passing away and the burial of this great Sheikh has been described. Such was the greatness of the Pir or the Pillar of the most distinguished Naqshabandi Tariqa. This Tariqa was before his time called “Siddiqiya”. After Shah Bahauddin Naqshaband (ral), however it came to be known as the Naqshbandiyya Tariqa. HAZRAT OAWIS AL-QARNEES [ABO AMER OWAIS BIN AMER BIN HARB BIN MORAD BIN KARN BIN AL-MORADEE] (May Allah Be Pleased With Him) was born in a small village called karan, situated in yemen he was tall, thin and weak his complexion was wheatish and his eyes were blue his body was very hairy and he had a dense beard. HAZRAT OAWIS AL-QARNEES (May Allah Be Pleased With Him) led a very simple and lonely life, spending most of his time in worship and the remaining tending and caring for his aged mother who was blind. he was very obedient and never went against the wishes of his mother his clothing consisted of a pyjama and a blanket make from camels hair food was never important, he would go on for days eating only dates and fasting. People considered stones mad, they teased and pelted stones at him when children stoned him, he would tell them to throw small stones at him so that he would be able to worship ALLAH despite the injuries he led a solitary life and was never worried about worldly affairs. HAZRAT OAWIS AL-QARNEES (May Allah Be Pleased With Him) clearly loved and followed the sunnats of PROPHET MOHAMMED (Peace And Blessings Of ALLAH Be Upon Him) his desire to meet the PROPHET MOHAMMED (Peace And Blessings Of ALLAH Be Upon Him) personally was never fulfilled because his mother needed constant care. inspite of this fact HAZRAT OAWIS AL-QARNEES (May Allah Be Pleased With Him) loved PROPHET MOHAMMED (Peace And Blessings Of ALLAH Be Upon Him) more than all the SAHABAS. On a instance it is said in Hadis that on hearing that PROPHET MOHAMMED (Peace And Blessings Of ALLAH Be Upon Him) had lost a tooth. HAZRAT OAWIS AL-QARNEES (May Allah Be Pleased With Him) broke all his teeth a gesture which none of the SAHABAS showed. Few people were aware of HAZRAT OAWIS AL-QARNEES (May Allah Be Pleased With Him) existance as he did not like fame once a man by the name of Rabi-Bint-A-Khatim waited patiently with the intention of meeting HAZRAT OAWIS AL-QARNEES (May Allah Be Pleased With Him) three days passed by, HAZRAT OAWIS AL-QARNEES (May Allah Be Pleased With Him) did not spare him a moment as he was totally engrossed in pray the man returned without meeting him. Before the end of PROPHET MOHAMMED (Peace And Blessings Of ALLAH Be Upon Him) he sent his Salaam and request to HAZRAT OAWIS AL-QARNEES (May Allah Be Pleased With Him) asking him to plead to ALLAH almighty for mercy and forgiveness of all mankind HAZRAT UMER FAROOQ (May Allah Be Pleased With Him), HAZRAT ALI (May Allah Be Pleased With Him) and HAZRAT BILAL (May Allah Be Pleased With Him)inquired a lot about HAZRAT OAWIS AL-QARNEES (May Allah Be Pleased With Him) during haj. with the help of the description given to them by PROPHET MOHAMMED (Peace And Blessings Of ALLAH Be Upon Him) they found HAZRAT OAWIS AL-QARNEES (May Allah Be Pleased With Him) in a jungle in yemen. they greeted him and presented the Kurta PROPHET MOHAMMED (Peace And Blessings Of ALLAH Be Upon Him) had sent for him. Taking the kurta HAZRAT OAWIS AL-QARNEES (May Allah Be Pleased With Him) went away deep into the jungle to ask ALLAH to spare mankind of his sins. his head bent in pray, HAZRAT OAWIS AL-QARNEES (May Allah Be Pleased With Him) did not rise, HAZRAT UMER FAROOQ (May Allah Be Pleased With Him) disturbed his prayer otherwise it is said that HAZRAT OAWIS AL-QARNEES (May Allah Be Pleased With Him) would have made ALLAH forgive mankind of each and every sin. HAZRAT OAWIS AL-QARNEES (May Allah Be Pleased With Him) invited HAZRAT UMER FAROOQ (May Allah Be Pleased With Him) the next day for fajr namaz he asked him to get along with him the king and his noblemen on reaching the mosque on friday fajar. the king, his noblemen, HAZRAT UMER FAROOQ (May Allah Be Pleased With Him) saw HAZRAT OAWIS AL-QARNEES (May Allah Be Pleased With Him) wearing rich and fine clothes, sitting on a throne it is said that the clothes, finery and throne were brought down by angels from heaven. this was a small Miracle of the lost capabilities of HAZRAT OAWIS AL-QARNEES (May Allah Be Pleased With Him). Towards the end of his life he lived in a cave and worshipped ALLAH day and night he joined the army and fought the “Jung-a-Safin” he died a martyr, fight Islam or is mujahedeen did not have to dig a grave for HAZRAT OAWIS AL-QARNEES (May Allah Be Pleased With Him) as it was already present. the burial clothes “Kafan” did not look like they belonged to the world. Casting an eye over the Islamic monuments in Yemen, you will be amazed to discover that they are indeed great and far from any kind of description. These Islamic landmarks had been centres of illumination and enlightenment for the establishment for the establishment of one of the greatest civilizations history have ever recorded. They also became a tourist bridge that receive local as well as international attention. They are perfect examples of the deeply-rooted civilization of Yemen. In this cultural article of this issue, I will be focusing on an important milestone of our Islamic culture at Zabeed, Al-Fakeeh House in Hodeidah. It is the grave of the Holy Man, HAZRAT OAWIS AL-QARNEES [ABO AMER OWAIS BIN AMER BIN HARB BIN MORAD BIN KARN BIN AL-MORADEE] (May Allah Be Pleased With Him). His grave is a pivotial monument highly Appreciated and admired by Yemenenis as well as Pakistani and Indian muslims. Who have annual festivals in this place. When writing this article, I also made Use of good book called “The Feature Layers of the Honest and Faithful People” by Aboo Al-Abass Ahmad Al-Zabeedi. Owais Al-Qarnees whole name was Abo Amer Owais bin Amer bin Harb bin Morad bin karn Bin Al-Moradee then Al-Qarnee. He is considered to be one of the noble, virtuous people who had done a lot to serve Islam. The PROPHET MOHAMMED (Peace And Blessings Of ALLAH Be Upon Him) talked about him and said that there would be someone called Owais from Yemen who will be known for his sincere followship. He is from the “Karn”, Indicating his nickname, who will come suffering from leprosy. He would ask God to cure him from this disease except for a small spot and God shall not turn him down. The PROPHET MOHAMMED (Peace And Blessings Of ALLAH Be Upon Him) also said that if he swore by ALLAH, ALLAH would carry out what he swore for. Then, he pronounced the name OWAIS and when they inquired about his identity, he said that he suffered from leprosy, had bluish-black eyes, broad shoulders, a long beard, he used to always look at his prying place and cry over himself. There was a bright spot under his left shoulder, which was a unique mark of his. However, he was very well known to be among the most faithful in heaven, so the PROPHET MOHAMMED (Peace And Blessings Of ALLAH Be Upon Him) asked OMAR BIN AL-KHATAB as well as ALI BIN ABO TALEB (May Allah Be Pleased With Them) if they could meet him one day and ask him to ask God to forgive their sins. When the PROPHET MOHAMMED (Peace And Blessings Of ALLAH Be Upon Him) passed away, HAZRAT OMAR and HAZRAT ALI (May Allah Be Pleased With Them) kept looking for him for almost ten years. however, they could Not find him at all. In the same year of HAZRAT OMAR's death, a person called Abo Kaiss Went at the top of a mountain in Yemen and shouted as loud as he could Asking whether the natives know someone called OWAIS. They told him that there was no one called so, then a person turned up and said that he had a poor nephow called Owais but he was a mere camel peasant. HAZRAT OMAR(May Allah Be Pleased With Him) asked him then about his distention. He was told that he was living in Ba’arak Arafat. Therefore, they rode quickly to Arafat. When reaching there, they could see him praying and his camels were around him they greeted him and then they asked his name. When he saw their insistence to know his name, he told them to leave him alone. Only then they told him that the PROPHET MOHAMMED (Peace And Blessings Of ALLAH Be Upon Him) told them that there would be someone called OWAIS, who suffered from leprosy and had bluish-black eyes. They told him that they wanted to make sure of another thing to prove that he was the right person. They told him that there was a bright spot under his left shoulder. When they saw it they started kissing him and asking for his blessing. They asked him to pray to God to forgive them and he refused. Then, he asked them who they were. Realizing that the two inquirers were not more than the CLAIF OMAR and ALI BIN ABI TALEB, he stood up and agreeted them and asded God to forgive and have mercy on them. When HAZRAT OMAR (May Allah Be Pleased With Him) tried to give him some money and clothes he refused and said that he earned his living from his work and he was content with what he had. Then, he asked them to go back to where they were and leave him to lead the same life style. However, interstingly after this incident, Owais give up his career as a camel peasant and devoted his life to worshipping God. During the caliphate of HAZRAT ALI(May Allah Be Pleased With Him), he participated in Islamic conquests. 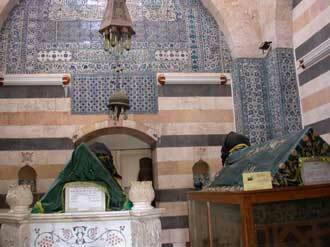 He was said to have died in Safeen during the caliphate of Ali bin Abi Taleb rule in 37. It is also said that he used to pray for long periods of time to the extent that he used to spend the whole day and night praying to God and asking for his forgiveness. Many people are used to visiting this place, especially Pakistanis who used to stay there for some days upon their getting back from Al-Haj (Islamic primilage) season. They stay there to perform some rituals. They also used to distribute some presents and gifts to the people living in the region. They also rebuilt and renewed the shrine several times. 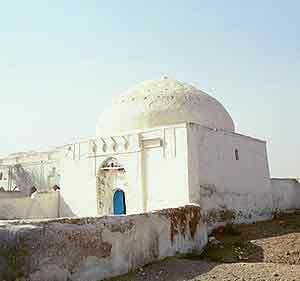 It is said that the French Orientals who visited Yemen in the nineties visited this shrine. However, today the people in the area feel very sorry because this shrine has not been appropriately cared for lately, and is suffering from ignorance and carelessness. The dome which appears in the picture was rebuilt after it was destroyed in the 12th Century (1320). When I inquired why the shrine was mostly visited by Pakistani and Indian Muslims, I was told that when Indians used to go to Al-Haj in the past, they used to moor their ships at Mocha, in Hodeidah. Then, they walked the rest of the way to Saudi Arabia through Yemen, as there were no means of transportation at that time. On their way, they used to pass by this holy shrine. They were very attracted to it for it was eloquently decorated. They used to stay there for many days before continuing their journey to Makkah. Thus, Indians and Pakistanis inherited the conventions of visiting this shrine. Today, visiting HAZRAT OAWIS AL-QARNEES (May Allah Be Pleased With Him) has become a practice done every year. This is the tomb of Pir Abdul Wahab Siddique (r.a) he is amongst one of the first Sunni ullama and mashaikh in the UK, before that he had been a khateeb at the Data darbar mosque in Lahore. His father Moulana Umar Acharvi (r.a) was known as Munazar-e- Azam Pakistan. His sons run the Hijaz college in Coventry. 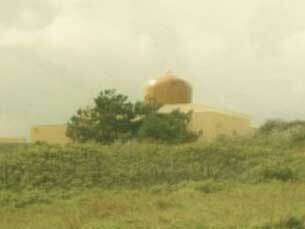 This is where the tomb is situated. 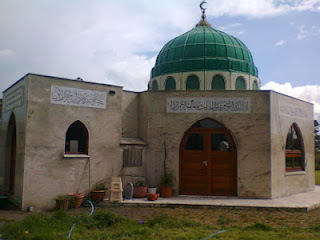 By tareeqat they were naqshbandi but this is a place of Faiz in the UK for all Sufis.